Last year saw me head to the frozen (quite literally last year!) North to attend my first Airecon in Harrogate. You can read all about my exploits on last year’s post-con Top 10 list, but suffice it to say I had a good enough time that I’ll be returning again next year. Tickets are already on sale for the event, and you can find out more by either visiting the Airecon website or getting involved over at their Facebook page. A three-day adult ticket costs just £28 (half that for youngsters), while adult day tickets are £12. It also has the advantage of being slap-bang in the middle of a lovely place. There were a few moans about the variety of food on offer last year, but when you have an entire town full of bars and restaurants literally five minutes away that complaint seems a little churlish! If you want uninterrupted gaming to the nth degree, bring provisions: personally I loved the fact I could take a break and easily have loads of great options within easy reach – and exactly the same went for accommodation. Alongside the gaming space and retail therapy, last year also had a full list of events including competitions, seminars, live shows and a quiz (we was robbed!) – and you can expect the same at Airecon 5. Again, its nice to have the option of distractions even if you don’t use them – and they’re held in a purpose-built space (Harrogate is a real convention centre town). And don’t forget you’re right on the edge of some beautiful countryside if you’re feeling more adventurous. This is probably starting to sound like an advert, but hey – last year was great and if they manage to supply more of the same in 2019 it may become my favourite con, so what can I say except hopefully I’ll see you there. I wouldn’t go if I didn’t like it! Luckily this year Essen Spiel coincided with the school half-term in the UK (and will again next year) – so Sarah and me took the opportunity to spend a lovely long weekend in Cologne. As always, I had a brilliant if exhausting time in Essen. I only had publisher meetings on Friday, dedicating the rest of my time to simply looking, playing and picking up review copies of games – as well as socialising and catching up with as many people as possible. I also spent chunks of time on both Saturday and Sunday on the Drawlab booth, talking about and signing copies of Witless Wizards: so if you were one of those that bought a copy, and particularly if we had a chat, thank you so much – it was great fun meeting and chatting to you all. The game did well and pretty much sold through the copies they had with them, which is all I could have hoped for – and all the guys (and gals) working on the booth did a brilliant job of explaining and selling the game – thank you all (again). In terms of organisation, this was the best Essen Spiel I’ve been to (this was my seventh). While numbers rose once more (more than 190,000 came through the doors over the four days) it rarely felt ridiculously crowded. The one exception was the Galleria, which has become an unfortunate bottleneck. I understand why they fill it with kids’ stuff, but they really need a new solution for next year so this area can simply be used a smooth funnel between halls. With the addition of a new entrance via Hall 6, it also meant there wasn’t really a hall where games went to die. Some smaller publishers in Hall 6 may dispute this, as it was mainly dedicated to everything from weird beer to cuddly toys, but overall it felt as if there was more of a flow between halls. I felt, in terms of new releases, it was an average year. The games generating buzz were often those which had limited copies, rather than the ones people were looking forward to most. I don’t think people wanted Newton more than Coimbra, for example – it’s just there were less copies of Newton available. In terms of innovation, you don’t expect to be saying Fantasy Flight stole the show – but they did. Both KeyForge and Discover have been troubling the top of the Board Game Geek Hotness list for months and were very highly discussed, played and coveted at Essen Spiel. I’m hoping to get hold of copies of both, but the idea of every box containing unique content – but with a shared rule set – is fascinating. Even if it isn’t perfect this time around, the idea computer algorithms are starting to make their own games (in a way) is a fascinating one. But beyond Fantasy Flight, the output from the larger publishers – for me at least – was largely disappointing: it felt more mass market and largely bereft of imagination. Titles such as The River (Days of Wonder), Azul: Stained Glass (Next Move), Solenia (Pearl) and Blue Lagoon (Blue Orange) felt derivative and unoriginal (if fine to play), which suggests to me the larger publishers are – probably quite rightly, in a business sense – targeting the ever-growing number of players new to the hobby. My hunt for interesting mechanisms and ideas kept leading me out to halls four and five – and the great majority of games I brought home were from smaller publishers (see my list of incoming reviews here). But again, this isn’t a criticism of the big boys – more an acknowledgement that, as the market continues to grow, the priorities for the larger publishers will change in terms of what they’re aiming at this new, uninitiated public. The fact masses of new gamers seem to think Century: Spice Road is a ‘game’ (to me it’s a mechanism at best) suggests I’m part of the past, not the future! Finally, a few words on Essen the place, as I’ve been mean about it in the past. My first few visits to the city (2012, 2013) were a real struggle in terms of finding anywhere nice to eat or drink, but things have certainly come on in the past couple of years. Fritzpatricks (pictured) still serves a great pint of Guinness and is the go-to place to meet up, while the Istra Steakhaus is still my favourite place to get a plate of meat and a lovely cold German beer on tap. But they’ve been joined by an ever-growing list of solid eateries on Rüttenscheider Straße and also Alfredstraße. Special mentions this year to the burgers and craft beers at Kohle*Craft*Werk and the hot dogs at Pan’s BeBop. And finally, a hotel bombshell… After seven years in seven different establishments, I have finally booked the same place two years in a row for 2019! Congratulations, Boutique 019. You may not be in the best location, and you may not have a bar, but the fact you have a nice breakfast included, good free Wi-Fi, comfy bed and good shower makes up for that. And better still, you have single rooms at under £100 per night – pretty much gold dust in Essen during Spiel. Being the world’s most mature board game market, Germany has a thriving second-hand game trade that stretches back into the nineties and beyond. It means you can find some amazing bargains alongside reasonably priced games that are super hard to find (and/or expensive) elsewhere. While we largely did the tourist stuff in Cologne she did humour me for a morning in what many describe as the best second-hand board game store in all of Germany, Spielbrett. Owner Nadine Pick was great company and I could’ve spent all day in the shop. The place really needs to be seen to be believed (check out the video snippet of one of the rooms below). An unassuming entrance leads to a series of small but jam-packed rooms full of games new and old, both in German and English, covering the history of the hobby. And I mean full – we’re talking floor to ceiling here, and some of the ceilings are pretty high. The actual collection stretches beyond 10,000 titles, with perhaps a third of that on display – but everything is catalogued, while you can enquire and even order much of it online (via Board Game Geek). Kupferkessel Co: (2001) A two-player game from Maori designer Günter Burkhardt that uses the same ‘move around the outside of a tile grid’ mechanism. I’ve been on the look out for it for ages, and this copy was still sealed. It was a SdJ ‘recommended’ back in 2002, but never got an English language release. Balloon Cup: (2003) This whimsical looking yet mean two-player game has been on my radar since playing it on Yucata – but I couldn’t bring myself to get the horrible Rio Grande reprint (as Piñata). I instead picked up the original German version, in perfect condition, for a cheaper price. Manhattan: (1994) Another classic (surprisingly aggressive area control) with a reprint that is no more appealing than the original; surprising in this case, as the original wasn’t exactly stellar in the looks department. Found the original German version for way under the price of a ‘new’ copy, again in great condition. Thurn and Taxis: Power and Glory & All Roads Lead to Rome: (2007/8) The original Thurn and Taxis is an enduring favourite, so I kept a lookout for its two expansions. I found both second-hand for less than 20 euros each, so snapped them up. Now to get all this new nonsense played so I can get to the old stuff! 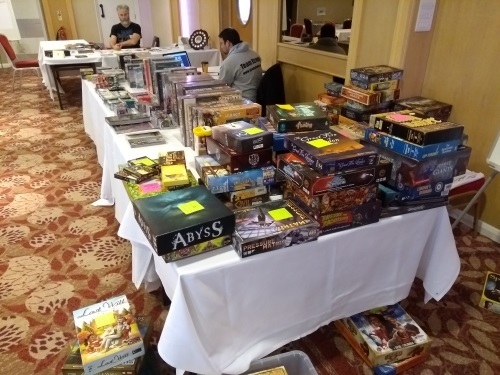 Having just gotten back from the first running of the UK’s newest board game convention, ColCon, what better time to give it a bit of a write up; especially as it looks like it will become a regular fixture on the gaming con calendar. My biggest takeaway was that, despite being very small (they didn’t have that long to promote it, from conception to event), it got all the most important thing right. So if you’re looking to plan your own convention – or wondering whether to come along to this one next year – hopefully this will stear you in the right direction. I’d never heard of Marks Tey, a small village outside of Colchester – but the important thing is that its easy to get to either by train (the station is a 10-minute walk from the hotel and less than an hour to London) or car (its right on the A12). We rocked up Friday afternoon and checked straight in. The Marks Tey Hotel is a Best Western, putting it firmly in the ‘better than a Travelodge’ category. And the organisers had worked out a price deal on a room that was a genuine bargain (£65 a double for two people, including brekkie). I’ve been to cons before where the deal is no better than promos you’d find on hotel comparison sites – while the larger cons pretty much leave you to fend for yourself, with local prices rising as the event gains traction over the years. The place was a little tired, but the bed was comfy: sold. Apart from the large (air conditioned when needed) room we were playing in, the hotel had loads of other areas (large and small) to expand into if we needed them – plus two bars, a restaurant, bar food. The food was pretty good too; standard hotel prices, but filling and tasty – as was the full buffet breakfast. There’s even a spa on site (steam room, sauna etc), plus a 15m pool and gym; even a tennis court. Did I use any of them? Of course not – I was too busy losing at games in a darkened room. But it’s nice to have the option – especially if you have a partner, children etc who want a little more to do. Like most smaller conventions, ColCon had a very friendly vibe. You got a name badge as you came in and there was a small but interesting game library on hand – although most people brought huge bags full of their own favourites with them. It was great to see a dedicated designer playtest area set up, with several playtest demos set up all weekend – as well as an upcoming Kickstarter title SSO (a narrative sci-fi game) you could try out. There were also a couple of small tournaments you could sign up for (Codenames and Terraforming Mars), but you got the feeling you’d have been welcome to try something yourself if you were so inclined. Alongside the games library (probably about 50 titles) there was retailer Xtreme Trades on hand, as well as a ‘bring and buy’ area for anyone trying to sell some of their unloved games. There were the obligatory ‘looking for players’ signs to pop on the table if you were – you guessed it – looking for more players; and you could get food brought to your table from a reduced-price menu. For £25 for the weekend (Friday to Sunday) you certainly couldn’t complain. Other important things: As well as Guinness on tap (a proper tap – not one of those shaky can thingies), the organisers had arranged for five (!) different real ales to be delivered from the local Colchester Brewery. Unfortunately one of them wasn’t their magnificent Brazilian Coffee and Vanilla Porter, but there was another nice porter amongst them (until it ran out early on Saturday – can’t think why…). As usual I seemed to spend as much timer faffing, drinking, talking and eating as I did playing games, but that suits me fine. I did manage 10 plays (despite no early starts or late nights – getting old! ), with the only game I had to learn from scratch being a prototype. I played four medium weight euros with old friends Keef and Clare: Yokohama, Deus, Transatlantic and Caverna. I started brilliantly in Caverna, but as always started to fade as the decision tree grew beyond my tiny mind – but managed to hang on for a share of the win. I also put in a decent display in Yokohama, coming a close-ish second, but I need to master the game’s arc. Again, I felt like I was motoring only to fizzle out toward the end. This was our first play of Deus with the Egypt expansion – and perhaps stupidly we used all the new cards at once. This led to an awful lot of reading between turns, and not really having a clue what synergies might be on offer, but the consensus was that while really changing the game’s feel it kept all the things we liked about the original intact: a big win. Transatlantic was a little less well received, but more of that in my next four-sided review (next week). Sarah joined us on and off through the weekend, which gave us the perfect opportunity to rest our addled brains with three lighter favourites: Ticket to Ride, Africana and Thurn and Taxis. The prototype I got to play was The Seven Dwarves: a Kingsburg-style dice placement game. As the dice roll/placement system is currently identical to Kingsburg, it may be one publishers turn their noses up at: but the goals have a simpler set collection/recipe completion feel, making it a faster but equally satisfying experience. It needs some work but showed potential. Finally, Sarah and me had a couple of games of the cruelly overlooked Adios Calavera: now our go-to two-player game. As well as the link to its website above, you can also stay up to date with future events by following ColCon on Facebook. It was my first visit to AireCon and only its second year in its new venue. But with dates already announced for next year (March 8-10, 2019) and a big bump in attendance numbers this year (which more than doubled to more than 1,500 unique attendees) it feels as if it’s here to stay. And I feel as if it is now one of the first things I’ll be adding to my 2019 calendar. Monumental: Now on Kickstarter, designer Matthew Dunstan had a copy of his latest prototype with him. It’s a card-driven civ building euro that plays fast (60-90 mins), but you get a satisfying feel of progression throughout. You start with a couple of unique powers but through deck-building soon diversify more – and a clever system of activating a row and column from a 3×3 card grid offers strong replayability. The modular map has you bumping heads too, giving that proper civ feel. Harrogate: As towns go, they don’t come much nicer. Despite being way oop north it’s an easy destination to reach by train – and once you’ve arrived, it’s very compact and pleasant to wander around. It’s got a lovely, oldie-worldy feel that reminds me of Edinburgh; lots of solid grey Victorian (that’s a guess) buildings and they’ve done well to keep the old town looking great. As it’s a big conference and tourist town, there’s also loads of variety in terms of hotels, bars and restaurants – including plenty of independent places. And better still, the prices are largely reasonable too. And better still, it’s only about a 20 minute walk to get out into the beautiful local countryside. 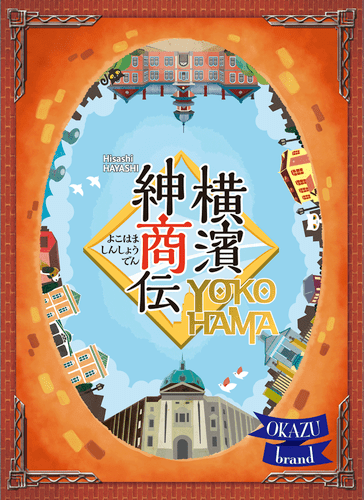 Yokohama: Despite years of practice, I’m still rubbish at picking out the best euro games from the huge annual list of Essen releases. This is another case in point: a game that passed me by in 2016 that, after two plays this year, I have totally fallen in love with. It has a similar modular board and route building mechanism to Istanbul, but there’s so much more complexity here. The theme and components add little, but the efficiency puzzle (as others players get in your way) is delicious. Add lots of ways to score, plus plenty of items to add variety, and you have a real winner for point salad fans such as myself. Fine dining (beer, pie etc): Conventions of any kind can be a nightmare when it comes to the food and drink on offer, often leading to low quality and small portion sizes for a high price tag. AireCon fell down a little on variety, but what it did have was lovely. Both the small pork pie stand and craft beer stall had really nice offerings, while the pizza van also served up great pizza. Beyond a coffee/snacks stand there was only a typical burger van for variety – and anyone with food allergies was poorly catered for. But from a purely selfish (and unhealthy) perspective, the beer, pizza and pork pies were magic! 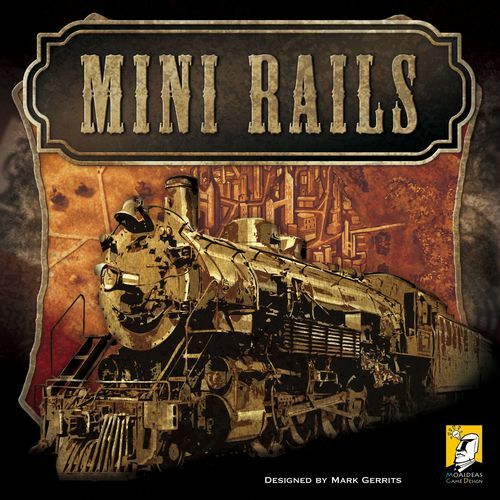 Mini Rails: One of the real arts of board game design is cutting through the excess nonsense to distil a game down to its pure essence – while retaining enough game to keep it fun. Admittedly this is after only one play, but Mini Rails seems to have nailed that concept. Buy stocks, build track, screw over the competition: this is a classic train stocks game in a small package that plays in under an hour, for three to five players. Mean, thinky and fun. (Oh what an) atmosphere: What makes a good con atmosphere? Friends and/or friendly, happy people – check. Welcoming but unobtrusive staff/vendors who all actually seem to be enjoying themselves – check. Loads of space, for both walking around and gaming, meaning you never worry about finding somewhere to set up a game or having to push through crowds – check. Even at peak times on Saturday, there were always free tables in several areas, which makes such a difference. There was also an area set aside for quite gaming, one for RPGs, ones with a view of the outside world etc. All this was hugely conducive to having a stress-free weekend. The unexpected: While you make grand plans to play all kinds of games at a con, you invariably end up playing a bunch of things you didn’t expect to. Often they’re horrible dross that should be burned – but even the worst of my experiences here were OK. The best were Aquasphere (a Stefan Feld I’d been put off of by the gaudy artwork, is a solid puzzley euro); Nyet! (a trick-taking game with an interesting twist) and Dice Throne (the Yahtzee mechanic used to good effect in a fantasy combat game). All three games, while I won’t be seeking out for my collection, I’d be more than happy to play again. 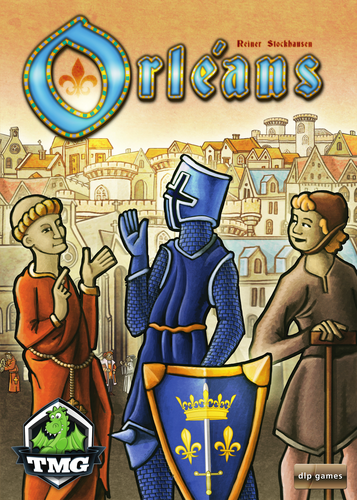 Orleans: I don’t have much of a list of game I’m desperate to play, but Orleans was on that list: a game I’d earmarked to grab at Essen 2014 but that hadn’t quite made the cut – and that I’d tried and failed to play ever since. Having recently been a little underwhelmed by its successor Altiplano I had lowered my expectations – but as it turned out, I far preferred this bag-builder to its more recent companion. The fun is in the puzzle of trying to work out what your opponents are trying to do so you don’t get beaten to the punch, while creating a strong but lean selection of tiles (as in any deck-builder – the bag is purely a gimmick). It also looks good and plays smooth. Of course it wasn’t all hearts and flowers – and I wouldn’t be me if I didn’t put at least a bit of a negative spin on proceedings. But I actually struggled to find bad things to say about my weekend. The hotel I stayed in (The Crown) had a good breakfast and friendly staff, but it was really noisy and the pillows were crap – but nothing some ear plugs and my own pillow wouldn’t fix! There was also a gaming pub quiz on the first night which was kind of fun, but totally shambolic with several really stupid (and not in a good way) rounds. A good idea but poorly executed – and hopefully it’ll work next time. And yes, those really were the low lights. As I wandered out of the convention centre late on Sunday afternoon, relieved to have booked an extra night so as not to have to leave early, I was powered by the warm glow of gaming goodness. Maybe in the morning I’d also have enough time for one last walk out into the Yorkshire countryside? Either way, a weekend well spent. See you next year! So this may surprise people, as anxiety isn’t something I’ve talked about openly before. I’d think most of my friends and acquaintances see me as an affable gobshite who tends to relish social situations as part of a never-ending crusade against growing up. But while some of that may be true, it just goes to show – there is often a bit more going on behind the curtain. I chose to write about board game conventions because they have been a big part of my social life over the past few years. I’m at my second of the year this weekend (AireCon), and the fourth in as many months. But I find them a mess of contradictions in terms of anxiety issues, so I thought I’d give a bit of a breakdown of my experiences – including the goods and bads that work for me (I know this may be totally different for others). One of the beauties of a con such as LoBsterCon or SorCon is the fact you have a hotel room in the same building as the gaming area – and what takes LoBsterCon to the next level in the last couple of years is the fact everyone staying in the hotel is at the con (so no awkward “what are those weirdos doing” looks from other patrons). The big plus for me is having somewhere close to escape to that’s totally your space – as well as knowing that if you forget anything etc, it’s just a few floors up in the lift. For this reason I often book an extra night after the con, because otherwise – once I’ve checked out – I can start to feel a bit trapped and edgy. If I don’t stay that extra night, chances are I’ll leave soon after check-out and miss a day of gaming. I also like to arrive an evening early where possible, to get settled in and to be mentally ready for day one. But of course, this locale bonus also relies on the hotel being somewhere you want to stay. Taking UK Games Expo as an example, the benefits listed above were largely negated at the Hilton last year: ridiculous room prices, even worse bar prices and a steady stream of rude and incompetent staff negated pretty much all the pluses (good breakfast though, in fairness). This may seem like a pretty minor issue, but these things are an absolute godsend: they should be made con-pulsory (ho ho) as far as I’m concerned. For the uninitiated, these are little flags you can put on your table as you’re setting up a game to indicate that you’re looking for more players to join you. Firstly, this is great when you look around a room (especially a larger one) to try and find a game. Just because someone is setting up doesn’t mean they’re looking for players, so it avoids potentially awkward situations and pointless, stilted conversations. Plus, it saves people having to walk around the room trying to find players – which again can lead to some super awkward conversations. But the unexpected extra bonus for me is people don’t (well, less often at least) see an empty chair and decide to come and impose themselves on you. I really don’t care if the game goes to five players: I’ve sat down with two good friends I rarely see to play it while we have a nice chat and a catch up – I’m sure you’re a nice person, but adding you would totally change the dynamic, so no thank you. This may sound odd, but I very much feel that – despite 100 people being a lot – I gravitate more towards smaller cons. Walking into a room with 100 people isn’t daunting for me: it’s not as if we’re going to have a Slaughtered Lamb moment where everyone stops talking and looks at me. But at the same time, you immediately take in a bunch of faces you know you’re likely to be seeing regularly over the next few days. I like that sense of belonging that comes from a smaller, more recognisable group: it’s probably why I never have a problem walking into my local pub even though I have nothing in common with many of the people that drink there – but when I’m having a bad day, I can fail to turn up to a gig by a band I love because I can’t face walking into a venue full of thousands of probably like-minded strangers. I’ve failed to book a hotel for UK Games Expo so far and I think (along with the price etc problems mentioned above) this is a big part of why. I don’t really want to go, despite the fact I do want to go. It’s too big for me, too impersonal, too shambolic (you can struggle to even find a table to play on at times in recent years) – but at the same time too enclosing and too in-your-face (especially in the vendor area). So… why the hell do you like Essen? Essen Spiel is unique. Over 100,000 gamers uncomfortably packed into a bunch of convention centre halls which have zero open gaming space – meaning everything there is geared towards selling you product. On top of that, unless you’re royalty you’re looking at a 15-60 minute walk – or a packed public transport cattle experience – to and from your hotel. Everything I hate, right? Wrong. Unlike every horrible sales pitch infested expo you may have attended before, you rarely find any hard sell here (unless you find yourself in the most outlying hall where terrible games go to die). In fact, if you see a stall worker that isn’t occupied they’re more likely to try and avoid your eye than get it – they’re probably taking a quick five-second breather from the retail carnage. Add this attitude to the virtual sea of seemingly millions of excited gamers and what I find myself experiencing is strange kind of peace: I’m with my people, immersed in the best my hobby has to offer, but absolutely no one is paying any attention to me. I can just bimble around people watching, game watching, researching, without a care in the world. Everything I want to see is there, but the level of interaction is in my control – something I find increasingly important nowadays. Later, when you get back to your hotel, you’ll probably find 90+% of the residents are fellow gamers – and the hotel (which are all well used to Essen Spiel by now) will have a small con-sized gaming area full of those familiar faces I spoke about before: people you’ll be in the same space with on the evenings for the week. Weirdly, somehow, that all makes sense. What can I say? That’s just me.